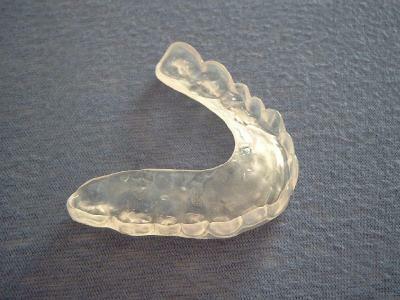 Night Guards are removable dental appliances carefully molded to fit the upper or lower arches of teeth. Night guards are typically made of a heat-cured acrylic resin. Soft acrylic or light cured composite, or vinyl splints may be made more quickly and cheaply, but are not as durable, and are more commonly made for short-term use. Soft splints are also used for children, because normal growth changes the fit of hard splints. They generally cover all the teeth of the upper or lower arch, but partial coverage is sometimes used. Night Guards are usually used on either the upper or the lower teeth, termed maxillary splints or mandibular splints respectively, but sometimes both types are used at the same time. We provide custom dental night guards at Sweet Water Dentistry! Come see us today! Or let us contact you about an appointment!